Carolyn White, PhD is a certified Aura Video Station Consultant as well as a Doctor of Clinical Hypnotherapy (DCH), a Certified Spiritual Counselor (CSC), and an International Hypnosis Federation Certified Instructor (CHI). She is also a Reiki Master and a certified reflexologist. Her passion for learning about our Human Energy System and the Mind/Body/Spirit connection has spanned over four decades, during which time she sought out mentors who were wise and pure of heart. She recently capped my life’s achievements with a doctoral program and thesis that awarded me a PhD in Esoteric Studies from American Pacific University. “During the past ten years, I have been privileged to do many consultations using the Aura Photography & Chakra Imaging System. For my clients, seeing the representative size, shape, and color of their chakras is an empowering experience – one that enables them to discover their “inner-tuition.” These chakra images show how their inner state can change by varying their emotions and thoughts. 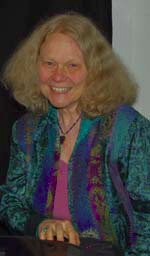 Carolyn is the author of ten different books on auras, chakras, and esoteric wisdom.